I'm looking at these images from a Hong Kong blog, and they totally look like The Real Thing™ to me. Sure they are blurry, but those applications' user interface definitely screams Apple design. The gallery shows the compass and autofocus in action—which can't work in current hardware. These could very well be the first shots of the new iPhone, featuring the new compass in action—which the current iPhone lacks—and video functions, as well as the autofocus in the camera. They look like polished new Apple applications. You can also see how the camera app can change between video and still modes, as well as the autofocus overlay—I wonder if you could change focus with your finger—and MMS screens. The more I look at these images, the more I'm convinced they are the real deal. 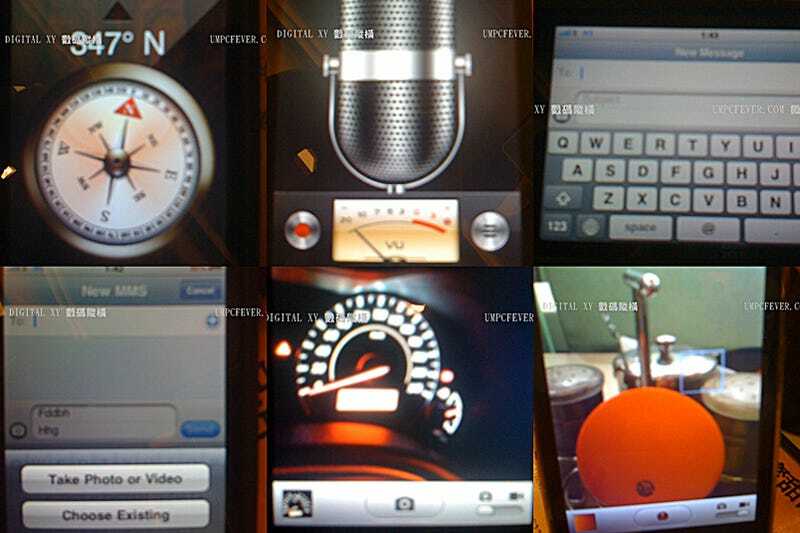 The compass and the autofocus are hardware functions which are not supported by the current phone, which explains why these apps are not part of any of the iPhone OS 3.0 betas. As we get closer to WWDC, it seems that some stuff may be starting to leak. We saw potential parts from the next-generation iPhone 3G and what may be a new finish.